Your very own A Girl and Her Wookiee desktop wallpaper (1024 pixels x 768 pixels). Right-click and "Save as..." to download. 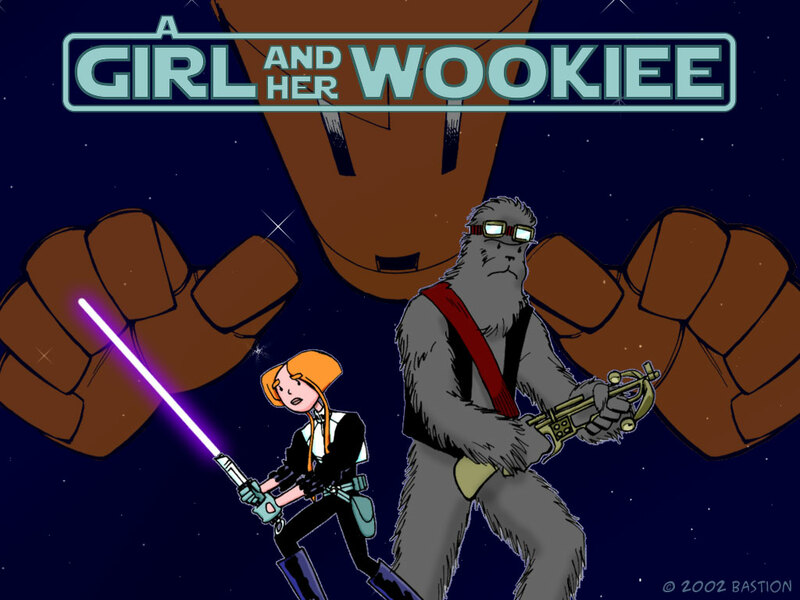 The latest episode of "A Girl and Her Wookiee" is the most shocking thus far! It's, well...not really an episode at all—but it is your very own "A Girl and Her Wookiee" desktop image! Download budding Jedi Knight Lorla Thisteen and her Wookiee companion, Tonkah, in all their 1024x768 pixel glory right here, and tune in again in two weeks when SWG Stratics' very own bi-weekly comic strip kicks it up a notch or two! This page contains a single entry from the blog posted on May 28, 2002 11:20 AM. The previous post in this blog was Episode 24. The next post in this blog is Episode 25.